Gosh! Time goes by so fast... I am happy to say that I belong to this site since 2008! :-) br It´s really good to belong to this family! 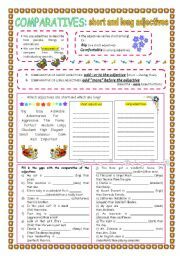 A worksheet with a short explanation of the comparative and 20 sentences to practise this grammatical item. My Ss loved it and understood it. Hope it´s useful. 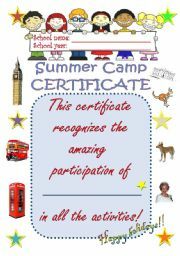 This is the Certificate I used in my summer camp this year. My Ss loved it. It´s colourful and it has many pics which can be explored, orally. It can be adapted to be any kind of certificate. Hope you like it!! 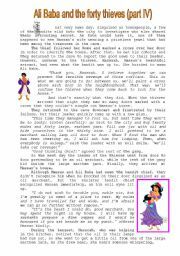 A Ws in which Ss will read a fable separated in pieces and organise it. Then there´s a T/F exercise, synonyms to find in the text and a crossword with those words. (answer key included) Finally they can draw or write a sentence to summarise the fable. This Ws comes with a powerpoint that I already uploaded with the fable. 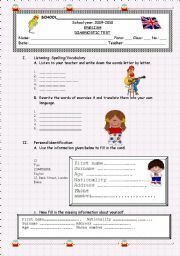 A 2 page diagnostic test for elementary level. Listening exercise, translating, writing personal identification, numbers and coloring a picture. 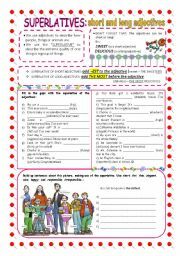 This a rephrasing worksheet that I prepared to my students, after teaching if clauses and reported speech. Hope you find it useful. Matching adjectives and pictures, to enlarge the Ss vocabulary. They can, then, write sentences using those adjectives and then you can start the topic "Adjectives degrees". Very easy. 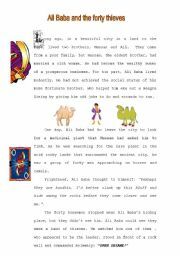 The fourth text, the continuation of the story of Ali Baba. The adventure goes on! :-) Students will read, answer four more questions and solve a crossword puzzle. Fun, simple and nice to learn english!!! A PPT with an interesting fable to discuss in class. 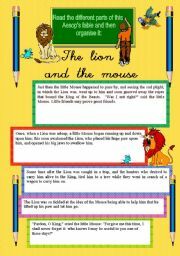 There´s also a Ws I made with some activities to develop in class about this fable. 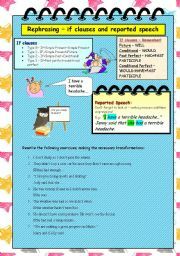 A simple explanation on phrasal verbs, followed by 10 sentences to complete with the given choices. Answer key included. A Powerpoint with some words connected to the world of cinema. A simple way of introducing the theme. My Ss liked it!